Scott Forstall, Apple's head of iOS development, demonstrated Passbook at the company's June Worldwide Developer Conference, highlighting the new app's ability to manage boarding passes, tickets, store cards and coupons, with novel push updating and geolocation features. In July, when asked by a financial analyst if Passbook hinted at the company's larger strategy for deploying a digital wallet infrastructure, chief executive Tim Cook described the new app as "a very key feature" but said he "wouldn't want to comment specifically on that point." Cook briefly described Passbook in saying, "I think all of us have found that we were getting many passes and many tickets, maybe boarding passes, that were getting scattered all over our iPhones in different apps. And so Passbook does an incredible job of pulling all of those to one place." If that's all Passbook was, it wouldn't be very special. Passbook doesn't offer the NFC "tap to purchase" features Google began promoting back in Android 2.x Gingerbread, and today's iOS apps can already generate digital passes, tickets, stored credit cards and coupons. The task of "pulling all of those to one place" could have been done by simply saving digital images to the Photos app. 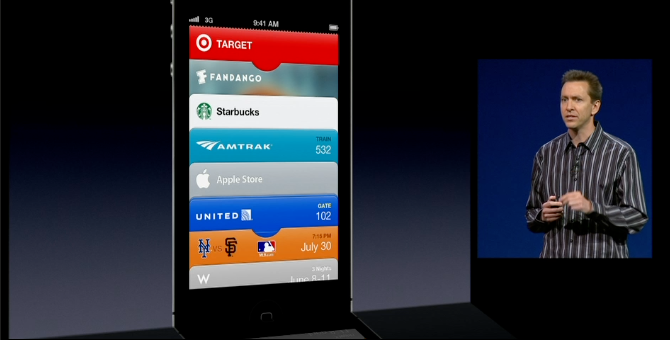 But that's not all Passbook does. In fact, while Forstall focused on the new Passbook app that will be bundled in iOS 6, the real power and utility of Passbook is not in the new app itself, but rather in the framework of functionality and infrastructure Apple created around it. In other words, the new Passbook app in iOS 6 is just the client interface for a series of features Apple has woven through iOS 6 and its supporting cloud services, including the App Store and its Push Notification Service. This makes Passbook a close parallel to Game Center; a central strategic effort to enhance the features of third party iOS apps with minimal effort. While Game Center allows game developers to support leader boards, group play and achievement tracking features in their gaming titles "for free," Passbook is intended to make iOS apps related to shopping and other retail transactions better, smarter and more visible to users. In late 2010, Google launched basic NFC features in Android 2.3. A year later, it introduced "Google Wallet" and Android 2.4 alongside the then-new, NFC-equipped Nexus S, part of an initiative that required the search giant to outfit thousands of retail terminals with NFC readers. Many observers expected Apple to bring the same technology to its iOS devices, backed by patents mentioning NFC that the company has been awarded, as well as reports of its partnership with NFC heavyweight Gemalto to develop a "virtual SIM." NFC works by transmitting weak radio signals between a special chip on a mobile device and a closely-positioned chip-reader integrated into a retailer's Point of Presence payment system, or potentially even a vending machine or other unmanned kiosk. All NFC itself does is replace optical barcode readers or magnetic credit card swipe readers with a radio link, ostensibly adding a new layer of security. 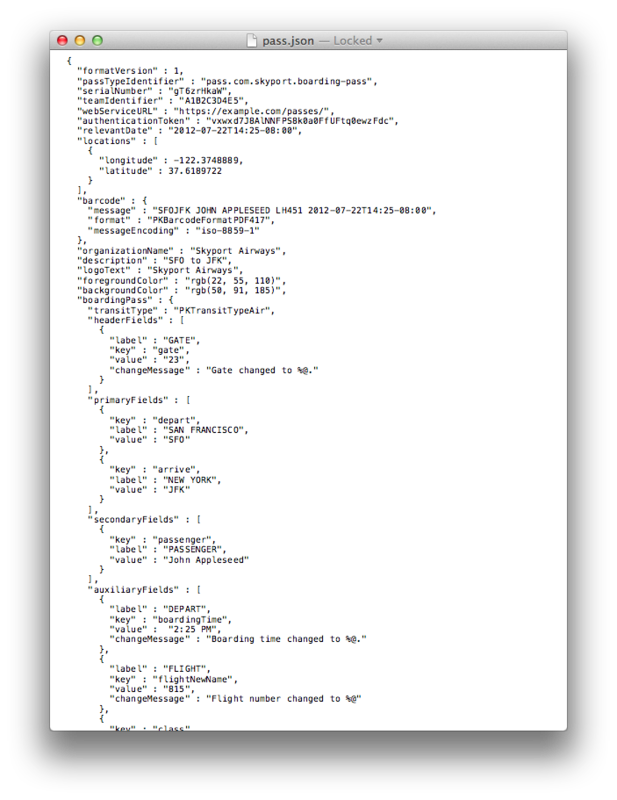 However, the way Google implemented NFC features in Android actually opened up all sorts of new security problems. At this summer's Black Hat security conference, smartphone hacker Charlie Miller demonstrated NFC security flaws in both Nokia's N9 and Android phones including the Google-branded Nexus S and Samsung Galaxy S.
In an interview, Miller told Dan Gooden of Ars that NFC "certainly increases the risk that something could go wrong. It opens you up to a lot more than you would think." Miller exploited bugs in Google's implementation of NFC that allowed him to open files and URLs capable of targeting known security flaws in Android. While Google has attempted to fix many of these flaws, more than 80 percent of the installed base of Android users is still stuck, months later, with a version of Android 2.x predating any of those fixes. Because none of today's iOS devices support NFC, for Apple to match Google in NFC it would have to begin adding NFC chips to its new iPhones and then wait for about a year before the majority of the installed base of iOS users could make use of the technology. Floating an exclusive technology on Apple's latest version of the iPhone worked fine for Siri last year and FaceTime the year before that, but probably wouldn't work well for a system that needs to be broadly usable right out of the gate in order to see any adoption. In January, a year and a half after Google began floating NFC support for Android, MasterCard executive Ed McLaughlin agreed in an interview that "the contactless payments industry needs Apple to hit critical mass." However, signs are pointing away from enthusiastic adoption of NFC by Apple. Instead, rather than trying to augment all the credit card readers across the U.S. with NFC readers while also deploying NFC chips on its mobile devices, Apple has so far only demonstrated the ability to enable smart transactions without requiring NFC at all. In Passbook, Apple's example tickets and coupons all simply use standard bar codes, which any virtually retailer or ticket vendor can already read. This strategy is therefore very similar to Apple's new iOS 6 Maps, which effectively duplicates the value of Google's years of efforts to collect StreetView images using its dynamically created 3D Flyover feature instead. Rather than speculatively scrambling a new hardware technology to market and bringing serious security concerns along with it, Apple has worked to deliver Passbook as a package of software features that addresses specific existing issues, with significant concern given to security. 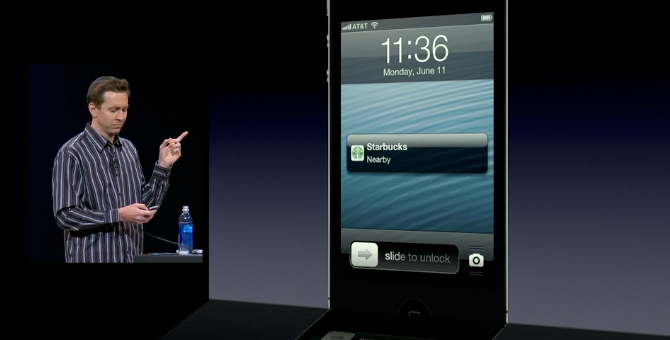 Passbook provides time and location based features that support organizing digital coupons and tickets, enabling coupon expiration dates and presenting proximity alerts when a digital ticket can be used, such as popping up a boarding pass when you enter the terminal or presenting a store card when nearby a retail outlet (as Forstall demonstrated for Starbucks, below). None of these features require an NFC radio or other new hardware to function, so Passbook will work on all devices upgraded to iOS 6, dating back to the 2009 iPhone 3GS. This immediate critical mass will attract the same kind of development that Game Center did (this summer, Forstall noted that over two thirds of iOS games now include support for the year old Game Center). Like Game Center, Passbook supports new features within third party apps, enabling developers to build creative titles that can, for example, generate limited-time coupons or sell entry to events. 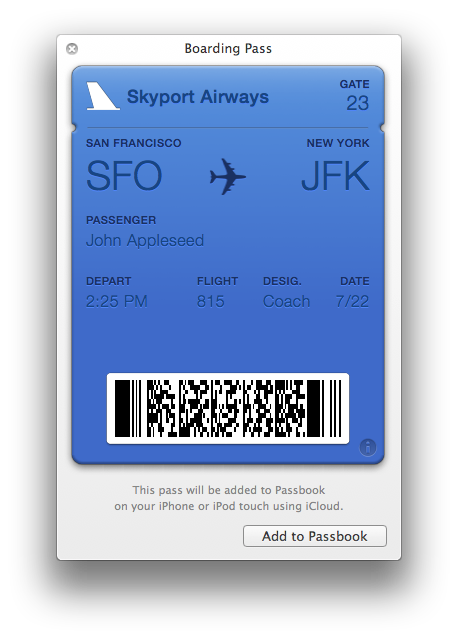 While third party apps can already create their own barcode-driven images (as some airlines already do for boarding passes, or as Starbucks and other retailers do for store credit apps), Passbook creates an easy to implement system where anyone can create tickets, sign them and distribute them in a way that iOS 6 can integrate into Passbook. They then compress and sign the document, along with any graphics, to create a digital pass. Signing the document makes it possible to validate as authentic and unmodified. The simple document can be easily formatted into a digital ticket readable both on the desktop (below), within any app, or visible within Passbook itself. iOS 6 also implements a variety of features to allow third party developers to update tickets after creating them. Using Apple's Push Notification Service, a ticketing developer can advise travelers of delays or changes to boarding gates, for example. And because Passbook "pkpass" tickets can incorporate location data, iOS 6 can highlight specific passes when you cross a specific geolocation "fence," such as entering a retail store or arriving at an airport or concert venue (as depicted above). This "Show On Lock Screen" feature can be turned off, along with automatic push updates, via the reverse side of the digital ticket accessed from the lower right "i" icon (shown below). It shouldn't be difficult for other mobile operating systems to display or support at least some of the features of Apple's Passbook tickets. However, Apple's interest in pushing Passbook is clearly aimed at tying advanced transactions and smart apps to its own iOS platform. There's already a vast critical gap between the the iOS App Store and Google Play, Amazon "appstore" and Microsoft's Windows Phone marketplace. With Passbook, Apple intends to make iOS 6 that much more attractive to custom development in a way that fails to benefit its competitors, without requiring retailers to adopt an entirely new NFC hardware payment system.